I really enjoy reading about how other people prepare and drink their coffee. One particular piece that sticks in my mind was Shawn Blanc's write up on how he prepares his coffee with a French Press. It's just the kind of blog post that I enjoy — a good subject and gained insight into the author's life. On the details, I've always thought it was interesting that he put cinnamon into his coffee. As someone who loves strong coffee and takes it black, that was something I would never try. And for eight months, I didn't. But a recent change in my coffee setup demanded a change. My espresso machine died (if you want, take a moment to pour some of your joe on the ground in honor of my close friend) and I've yet to replace it. I'm considering an Aeropress, but I need to time to grieve properly first. Back to the point of the story. 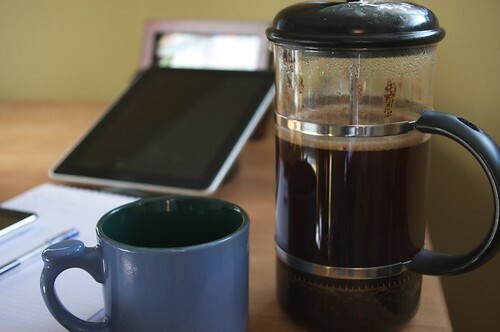 My current coffee setup does not include a conical burr grinder, and with no espresso machine, I've been drinking my coffee via drip or French Press. The bad part is that without a proper grinder, the flavor can often fall short. So, I tried Shawn's tip with the cinnamon. And the results are fantastic. The slight flavor of cinnamon seems to negate the slightly bland flavor of the coffee. So, the mornings are a little brighter once more. Now, this is not a proper fix, but a temporary solution. Once the Aeropress and grinder are in the house, the cinnamon will be moved back to the spice cupboard. But for now, hat tip to Mr. Blanc.